The tennis landscape in the Kansas City area is quite rich, including a two-time grand slam doubles champion in Blue Valley North graduate Jack Sock. 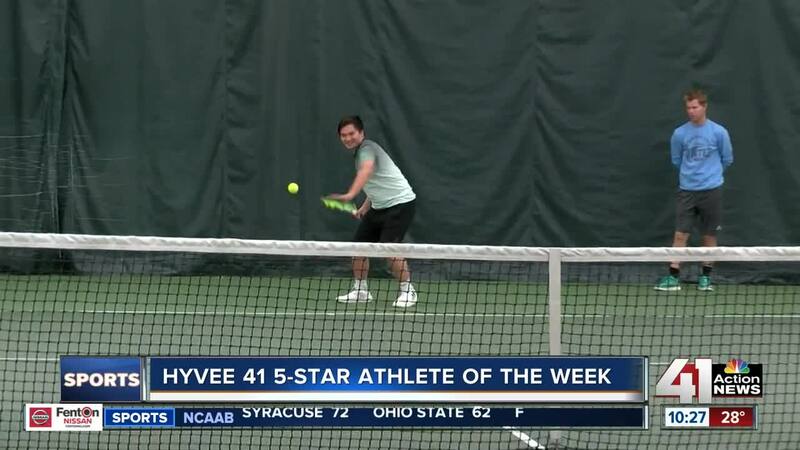 Shawnee Mission Northwest senior tennis standout Nam Pham, a member of Kansas City United Tennis at the Overland Park Racquet Club and this week's Hy-Vee 41 Five-Star Athlete of the Week, might be the next great tennis talent from Kansas City. KANSAS CITY. Mo. — The tennis landscape in the Kansas City area is quite rich, including a two-time grand slam doubles champion in Blue Valley North graduate Jack Sock. Shawnee Mission Northwest senior tennis standout Nam Pham, a member of Kansas City United Tennis at the Overland Park Racquet Club and this week's Hy-Vee 41 Five-Star Athlete of the Week, might be the next great tennis talent from Kansas City. Nam has enjoyed a spectacular high school career and also has received NCAA Division I scholarship offers from Penn State, Drake and Illinois State. "It feels great to know that maybe over a decade of tennis has really paid off," Pham said. "I can really go to a really good college and get a really good education. And if I go to any of these schools, just know that they want me and for me to be an impact on their team, makes me feel really good." Nam remains humble, but plenty of people ho know him are happy to sing his praises, including Overland Park Racquet Club Director of Tennis Anthony Perkins. "This summer he won a (United State Tennis Association National) Level 2, which is a big national tournament," Perkins said. "He won a Sweet 16, which is like a national championship in the Missouri Valley, as well as reaching the top 16 in the country here this past weekend (during the USTA U-18 boys national championships). If I had to guess, I'd say, he's probably won close to 75 or 100 matches this year." Nam finished in the top quarter of the draw at last weekend's tournament, which included the top 64 players in the country. He was disappointed not to finish even better, but said he probably learns as much from losing as winning. "Not winning a match, it's just to train harder and fix up and tweak all the bad parts of my game," Pham said. "That tournament consisted of the best 64 players in the nation, and to finish in the top 16 is really a pleasure. It probably isn't the greatest place to finish for me. Every match, you had to play even better than you usually think you would." Now, Pham looks forward to his final high school season, picking a college for tennis and refining his skills as a player. "He's the No. 1 player in the Missouri Valley — which is a seven-district area, a five-state area," Perkins said. "He's also, hopefully now, (going to) be in the top 30 in the country. (He's already the) best player in the state of Kansas as well, so we've got high hopes for him for college tennis." Note: The Hy-Vee 41 Five-Star Athlete of the Week segment airs every Wednesday night during school year in the 10 p.m. sportscast.